Long gone are the days when onions, dill and parsley accounted for virtually the entire list of spices. Now in stores you can find the most exotic spices and herbs. Their range is really dazzled, and now the host is the problem - how to combine spices and seasonings in dishes. First we need to understand that herbs and spices not quite the same thing as suggested by many. Spices only change the taste or consistency of food. They are added to the dish during cooking to enhance its flavour and make a salty, sweet, spicy or sour. Sugar, salt, vinegar, citric acid – one of the most common spices. 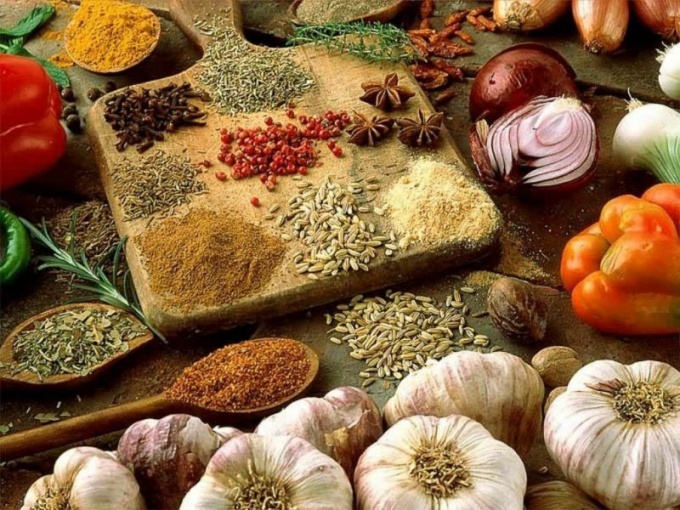 Spices are responsible not only for the taste but also the flavor of the dish. They are, as a rule, are of vegetable origin: the leaves, buds, fruits, roots of plants, which have a specific and very robust flavor. In addition to the mouth-watering scent, they are able to give food a bitter, astringent or pungent taste. Many spices – part-time medicinal herbs. They stimulate the withdrawal of toxins from the organism and development of bacteria. Spices used to make culinary masterpieces of a certain emphasis, at times decisive. Cloves can be used in sweet dishes and in soups, dough and marinades. This spice is also perfectly accentuate the taste of meat stew. Oregano is the main seasoning for pizza. According to Piccolo, without it is not worth starting to prepare this dish. Coriander is perfectly set off the taste of soup or fresh salad. Besides, he holds the record for the magnesium content. It will solve the problem of those who are not recommended for spicy food, since it was not hot, but cool. This spice is pleasant and useful as a hammer, and grains. It is also used in the preparation of kvass, syrups, mousses. Turmeric and curry perfect for pickled cabbage, chicken, fried potatoes, rice. They will easily give the dish a nice Sunny shade. Turmeric is also used as a preservative. Cardamom can add to the pilaf, sweet milk porridge, cakes, spice-cakes, gingerbreads, cookies, cupcakes. They are flavoured jellies and compotes, coffee and tea. Cinnamon is suitable for fruit dishes, pies, jams, jellies, drinks. Its fragrance improves your mood and invigorates. Especially good cinnamon goes well with dishes with apples. One pinch of cinnamon added to hot milk, significantly improves its absorption. Nutmeg is good for making creams, sweet puddings and jams. It can be combined with pumpkin, potatoes, turnips. It can be added to improve the taste of fruit punch and tomato juice. Saffron – the real king of spices. It is often used to flavor cakes, cookies, drinks. It is beautiful in the company of hot milk. The poultry dishes are ideal marjoram, thyme, thyme, rosemary, Basil and sage. Fish dishes will not do without pepper, coriander, Bay leaf, ginger, mustard and thyme. Smoked meat will taste even better if you spice it up with ground pepper, nutmeg, cardamom, marjoram, cumin, coriander, ginger. The game perfectly combines with the juniper, thyme, crushed red pepper and oregano. There is one caveat: if you cook, bake or fry meat, add spices for a couple of minutes until fully cooked meals, otherwise their flavor will evaporate when heated.